There is more than meets the eye when it comes to a neat and tidy house. 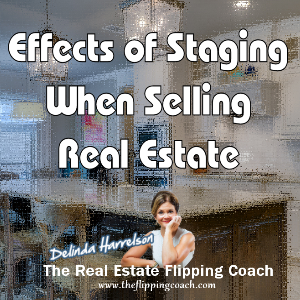 The effects of staging when selling real estate go much deeper than that. Whether you are selling your personal home or selling your real estate investment property, the effects of staging any home for sale is something that should always be kept in mind. Obviously, there are several other things you should keep in mind when selling real estate, but one those on the top of your list is staging your home for sale. Think about a house that you may have walked into that was empty. It could be painted impeccably and meet every possible standard, but there always seems to be something cold about an empty house. It’s best to not show any house when it is empty to people that are thinking about buying it to make it their new home. They will feel anything but homey when walking through the home. Home staging is a huge selling point, particularly for those who are trying to sell homes quickly. If the home doesn’t sell after the first two weeks or month (you decide the time limit) then you may want to remove the ‘staging’ furniture in order to eliminate the expense. I would strongly encourage you to keep this furniture as long as the home is being shown fairly regularly. Staging a home, however, has a little more to it. Staging is not quite as simple putting furniture in the property you are trying to sell.You want to create an atmosphere or warmth and comfort. This means you want to have carefully selected pictures on the walls, mirrors, plants, and pillows. You do not have to purchase items, particularly for this part of home staging. You could use things from your own home in order to establish this atmosphere of homelike comfort. Be sure not to use sentimental favorites or very valuable pieces, you would not want to loose those if someone viewing your home found it just as nice as you did. It’s a sad reality but something to consider all the same. Other things that may help an empty home sell are scents. There is nothing quite like the smell of cookies in the oven, flowers in bloom or apples in a basket on the counter to make a home feel ‘homey’. If you can find authentic looking ‘fake’apples at a good price, buy them. you can use them in every house you sell. Every kitchen should have a basket of apples on the counter or kitchen table when staging your home. Some other home staging “scenes” include well placed scented candles, potpourri warmers, dry potpourri, fresh-cut flowers, and electric room air fresheners. Don’t over do it with the fragrance. There is nothing quicker that will turn off potential buyers than an overpowering fragrance. In other words, the “smell” of the home, as in the fragrance and the amount you choose to use, is yet another part of the staging process that works for many trying to sell homes. The effects of staging correctly when selling real estate can easily and often does turn what may have been a “no” to a “yes”.